In the “Car Radio Reception Article 1“, we discussed the two most common problems with radio reception. The first problem we noted had to do with radio reception interference. We discussed the different causes for this frustrating problem, and we promised to provide possible solutions in this article. The second problem we discussed was simply a weak AM signal. If you’re not happy with the performance of your radio, read on. • If possible, disconnect the whip antenna in your car and start your car. • Tune your radio to a clear, open channel without any programming and listen to the static. • Step on the gas pedal to raise the engine’s RPM. • If you hear the same noise you heard with the whip antenna connected, then you now know that the source of the noise is the car’s electrical system and the wire that supplies power to the radio. • If the radio noise problem originates in the car’s electrical system, you should have your electrical connections inspected, especially the grounds, and you may have to install a noise filter on your radio. • Start your engine again and step on the accelerator again. • If you hear noise that increases as you step on the gas pedal or a very high pitched crackle, the noise is actually being transmitted from your car and being sent through the hood to your antenna. • This is very common and the easiest type of noise to correct. • If the car is a few years old or has a lot of miles on it, the cheapest and most common solution is to change the sparkplug wires on your car to original equipment or resistor-type spark plug wires. Solid wires will cause more noise problems than you had in the first place. • If this does not cure the problem, check your distributor cap for excessive wear or arcing. • Also, check the coil wire to ensure that it is not arcing. • One of our engineers says that from his own experience, opening the hood of your car, starting the engine, and looking around for sparks will often help you find the source of the noise if an electrical connection is arcing. • Many people have eliminated the radio noise by having a complete tune-up on the vehicle. This type of noise can be reduced or eliminated by grounding the hood to the firewall with a flexible copper strap. Unless you have a lot of experience working with cars and radios, please leave this type of work to the professionals. You should also check to see that the antenna’s coax feedline is grounded properly both at the radio and where the mounting bracket touches the body. One more source of possible radio noise is your fuel pump. Please visit http://www.arrl.org/fuel-pump-noise for information on fuel pump radio noise — particularly some information from Ford. If you have your own story about solving radio noise problems, please share it with us. If you are dealing with reception interference problems on your home or office radio please visit our Radio Noise and Possible Solutions page for a very informative radio interference troubleshooting guide. The next problem we will discuss is poor or weak AM reception. If you suffer from poor reception and have a portable radio with much better reception than your car’s radio, the problem is most likely the antenna. Cars are very susceptible to vibration, corrosion and other factors that conspire to degrade the AM reception. If you have an older model car or live in an area where conditions cause a lot of rust or corrosion, your poor AM reception might originate at the base of the antenna or the inside of the fender. If you can, unscrew the antenna, and look for rust or corrosion where the antenna attaches to your car. Removing the antenna and checking the contact to the fender often reveals the corroded parts that might be interfering with your radio reception. You may find that you’ll either need to replace the antenna (if it’s corroded or rusted) or go for a Full Replacement Auto Antenna. Be sure to check the coaxial cable connector at the antenna base to see if there’s excessive corrosion at the contact point as well. 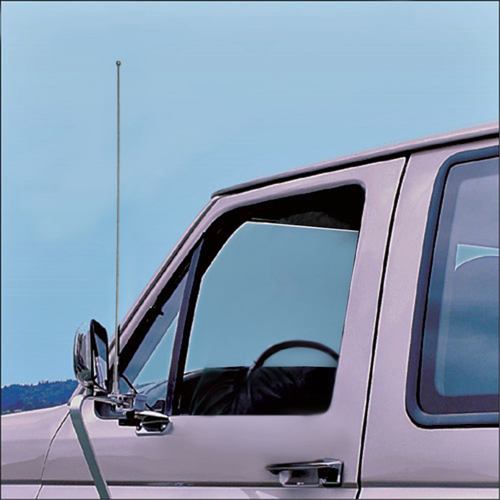 Some vehicles on the market don’t have an external “whip” type antenna, and instead, have their antennas imbedded in the glass. These antennas typically don’t work well for AM radio. We suggest installing (or paying a professional to install) a Full Replacement Auto Antenna on the fender of your vehicle and disconnecting the in-glass antenna. The full replacement antennas can simply be attached to the front fender of most cars, trucks and mini-vans. Once you’ve zeroed in on the source of your car radio woes, and have gotten that fuzzy reception back to factory specs, or better, you may want to boost your indoor radio reception as well. Heck, you don’t want to be stuck in the car listening to the end of a talk show or a ball game just because you know you don’t get good reception inside. Fortunately, improving indoor radio reception is much easier than tinkering with a car. A Twin Coil Ferrite AM Antenna will work magic for AM radio reception, while a FM Reflect Antenna will do the same for FM. Put it all together, and you’ll have the best radio reception in town — and won’t miss a thing.